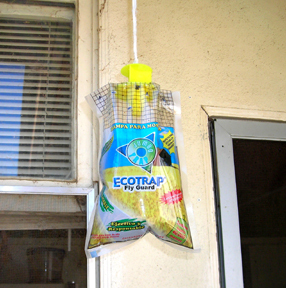 Jumbo Bag Fly Trap has more bait and lasts longer than other disposable traps. Attracts flies from a 20 foot radius. Traps and holds 40,000 flies. No harmful chemicals or pesticides (the flies drown in the trap). The plastic bag is more resilient than competitors with an additional seal that makes the trap more resistant to tearing. - outside where flies are abundant. - near fly sources, such as trash bins, compost piles, animal pens, stables, gardens, and patios to draw in a 20 foot radius. - where you want the flies to go. - different spots and various heights to find where you catch the most flies. - some find 3 –5 feet from the ground works well. - warm weather, place traps in shade. - cold weather, place traps in the sun where the temperature is about 70º F.
Soluble powder inside the trap is a scientifically formulated fly bait. Water dissolves and activates the bait, which is formulated to lure most common nuisance fly species into the trap. The trap becomes active 2-5 hours after adding water. As the trap ages, the attractant (bait) gives off a stronger and stronger smell that can be hard to tolerate in poorly ventilated areas. Don’t let the traps dry out. 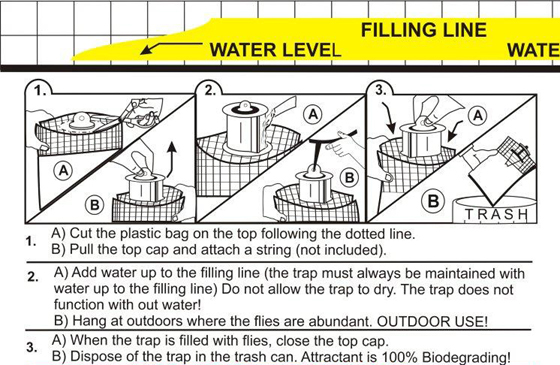 Maintain water in the trap all the time. Don’t change the water. Just add more water to bring traps back to the fill level. In case of ingestion, do not induce vomiting. Instead, drink water to dilute. Non-poisonous, but tastes terrible. In case of eye contact, wash with water for 15 minutes.